In a small bowl, combine chipotle seasoning, garlic powder, onion powder and cinnamon. Set aside. Halve, peel and thinly slice red onion. Drain pineapple rings (reserving juice) and pat rings dry. Place a large non-stick pan over medium-high heat. Add 1 teaspoon olive oil and add pineapple and onion to hot pan. Sprinkle with brown sugar and pineapple juice. Stir the onions frequently and let the pineapple cook until lightly seared, about 3 minutes on each side. Transfer to a plate. Pat pork chops dry and lightly season with salt and pepper on both sides. Using the same pan, heat 2 teaspoons of olive oil over medium-high heat for 1-2 minutes. Swirl to coat the pan. Add chops to the skillet and let sit for 3 minutes until seared and brown. Flip to other side and sprinkle chipotle-seasoning mixture over the top. Let sit for another 3 minutes. Flip one or more times until pork reaches a minimum internal temperature of 145°F, another 3-5 minutes. Remove to a plate and top with pineapple and onion. Sprinkle goat cheese and parsley (if desired) over the top. 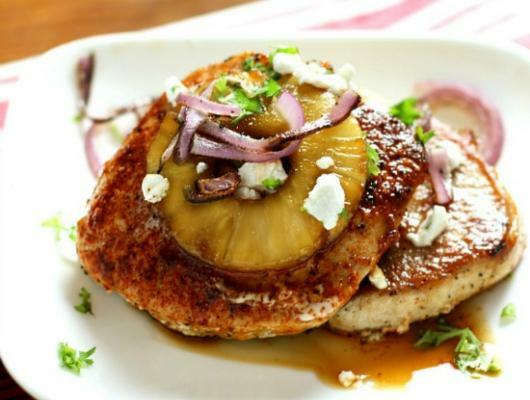 Brown Sugar Pineapple Pork Chops with caramelized red onions and tangy goat cheese are a one-skillet delicious supper. 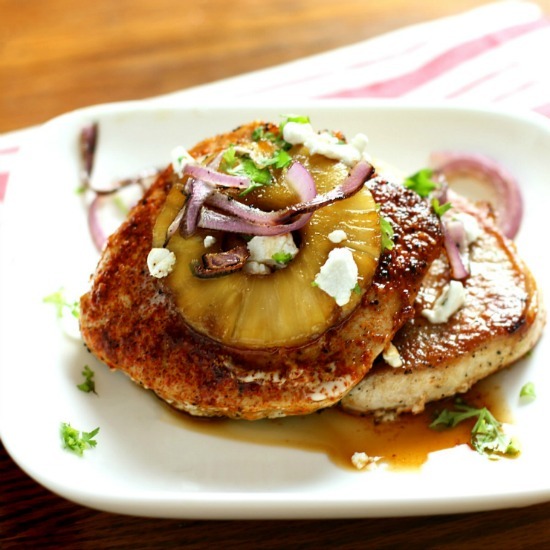 It’s a sweet take on juicy pork chops that are quick and easy to prepare!